Description: SEPO crosses from the #2 track to the single track at CPF-273. Description: The two lead units from POSE have come down to CPF-273 to pick up SEPO's train. Description: MEC 608 sits with MEC 611 in Westford, wreck train in tow. BM 3288, "the pie car," is visible behind the locomotive. Description: After crossing Winthrops last downtown crossing Oil Xtra continues north skirting the edge of Lake Maranacook. Shortly the whole train would be visible in one of the coolest sights Ive ever seen. Description: POSJ BNSF 8974 Extra - Crude Oil with MEC SD40-2 #608, through Leeds Jct. Description: The trees are just starting to turn. 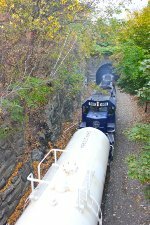 Title: Just in the "Nick of time"
Description: A Guilford and Pan Am locomotive work to accelerate their string of OMYA tanks out of North Adams probably destined for Hoosic Junction, i arrived just as they were leaving and did the best i could for a photo at the Foot Bridge by the small tunnel entering the old yard site. Description: Almost thought I'd miss this! Description: And still got to work on time! Description: CSX Q418 departing Pavonia Yard with a CSX GEVO and MEC SD40-2 in Pan Am Railways paint. Description: CSX Q418 passing by West Trenton Station with MEC 608 trailing. Description: Not quite the angle I wanted, but the other one I had in mind was backlight as anything. Q418-13 blasts east through Langhorne with no work at Woodbourne Yard with CSX ES40DC 5201 leading a rare visitor. Description: Very rare unit for these parts, MEC SD40-2 608 in Pan Am RR paint trails on Q418-13.